Precious Metal Clay or Art Clay can be fired in any furnace that will sustain the required temperature with reasonable stability. Almost any kiln with a pyrometer, like those used for burnout or enameling, will work. 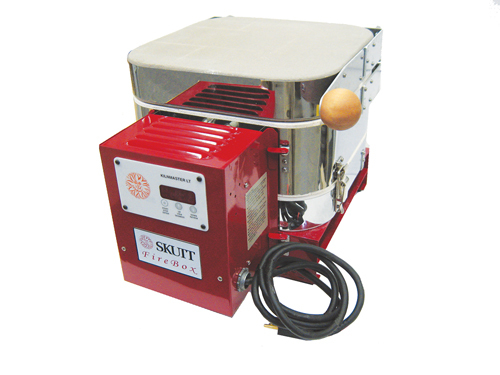 The kiln should be located away from combustible surfaces and plugged into a properly wired socket so that its cord cannot be snagged or tripped over. It's helpful to have work gloves, long-handled tongs and a heat-resistant surface like a brick in front of the kiln to set work on when it comes out of the kiln. We sell a programmable kiln that maintains a selected temperature for a set length of time, then shuts off automatically. Though not essential for success with Precious Metal Clay or Art Clay, this unit is designed specifically for silver clay and makes the firing process as foolproof as the modeling. When Precious Metal Clay or Art Clay is fired, the water and binder vaporize and disappear completely. Because these together make up about 30% of the original Precious Metal Clay or Art Clay, the object after firing is reduced to about 70% of its original size. This offers exciting possibilities because the shrinkage is proportionate. All the images, textures and details you create in the clay original will be retained in the final version--0nly smaller! This is a little like using the reduction button on a photocopier and nearly as easy. PMC+ has a higher metal content. Fired PMC+ pieces are 88% of the original size. Firing To See kilns Click here. As the following chart describes, shrinkage, density and hardness all increase with time and temperature. That is to say, if you "short fire" Precious Metal Clay or Art Clay you will make it weaker. The longer the firing process the denser the metal, achieving maximum at the durations shown below. Firing at temperatures above these risks melting the material-it's real metal and will melt just like conventional metal when heated to its melting point. Pieces may be fired any time after they are made, though pieces with widely varying cross sections should be dried slowly to prevent cracking. Flat pieces are laid directly on a kiln shelf, fire brick or clean soldering pad and set directly into the kiln. Work can be very close together as long as the pieces don't touch each other. Contoured or hollow pieces require a little more care to ensure that they don't slump or collapse during the process. Support these forms on vermiculite, or alumina hydrate powder , available from us. It can be reused almost indefinitely so a couple of pounds should be enough for most studios. Set the completed Precious Metal Clay or Art Clay object on a heatable tile, cradling it in a bed of alumina hydrate if the form is other than flat (middle drawing above). Set the tile into the kiln on bits of brick that lift it off the floor, facilitating both heating and removal of the object. Program and start the kiln or, if firing manually, turn it to a high setting. Precious Metal Clay or Art Clay does not need to be vented, though when other materials are included (like cores), ventilation may be necessary. If you have a manual machine: When the pyrometer indicates that the correct temperature has been reached, turn the dial back slightly to ensure that the temperature does not go higher. Check the clock and maintain this temperature for at least two hours. There is no disadvantage in heating the work longer. When many pieces or a sagger box is used, a longer time is recommended to ensure complete fusion. When the time has passed, turn off the kiln. A compact, handheld butane torch will fire PMC+. Get used to torch firing with this experiment. For the record, it has always been possible to fire Precious Metal Clay or Art Clay with a torch. The hard part was finding someone to hold a torch for two hours! With the creation of PMC+ torch firing became a viable option. As we know, PMC+ is converted into solid silver when heated to 1650° F (900° C) for 10 minutes. At this temperature, even at a few minutes less we can make solid silver jewelry. 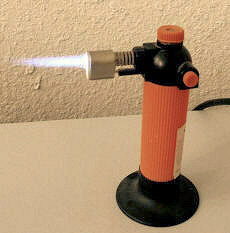 Jewelers use a variety of torches, all of which deliver more heat than is needed to fire PMC. People with experience in metalwork and a good idea for heat colors will be able to fire PMC+ with any traditional torch. If a person is buying a torch specifically to fire PMC+, a butane torch like the Blazer makes a good choice. These compact torches are relatively inexpensive and are available from us. In fact I even saw one at a kitchen supply company where it was sold to caramelize crème brûlée. The torches are sold empty and filled (and refilled as needed) from a can of butane that can be bought from the same suppliers, grocery stores or tobacconists. Note that the standard torch is rated at 2000° F so it can melt PMC. Another interesting torch uses a disposable cigarette lighter as the source of fuel. These clever torches are inexpensive but are limited to only very small items. Here's a test I recommend to anyone who intends to fire with a torch. It takes a few minutes and requires the investment of a dollar or two in PMC, but it will go a long way toward understanding the process and building confidence. Pull off a peanut-sized bit of PMC+, split it in half, and roll out two small rods. Follow the instructions above with one added step. After the complete cycle, move the rods apart on the brick so you can focus on one of them. Concentrate the flame on this rod in an effort to melt it, which might be possible even with the regulated torch. You'll see a bright mercury-like skin form on the piece and the red color will become even brighter. The edges will start to curl and the PMC will be drawn up into a ball. Make a mental note of what you saw and this way you'll know the signs of melting so you can withdraw the torch in time before damaging a piece you care about. To complete the experiment, allow the other rod to cool and test it by bending, filing, burnishing and polishing. This will confirm that, sure enough, torch firing really works! 1. Position a stainless steel mesh over the gas burner, turn on the burner and note where the mesh glows red the brightest, that's where you will put your small dry piece. 2. Turn off the burner and place the PMC3 or Art Clay 650 piece on that spot that glowed the brightest. 3. Turn on the burner LOW and watch for the binder burning out (smoke). 4. When the smoking stops turn up the burner until the silver clay turns red (turn off the lights to see it better). 5. Set the stove's timer for 10 minutes. 6. Be Careful the mesh and silver is HOT! Cool as normal. Make sure the silver clay is as dry as possible. Don't try this with very large thick pieces or large stones. If the silver clay glows bright orange turn the stove down. Q. How do you fire Art Clay Silver in a cone sitter kiln? Low fire clay fires to 1200 F which corresponds to cone 019-020, the highest recommended firing temperature of all silver is 1650F or cone 010-011. Ceramic kilns fire much slower than jewelry kilns so the actual hold time is not too important. For PMC3 or ArtClay 650 fast fire to cone 017 no hold time needed. (Fire on High until the cone turns off). let cool as long as you can wait. For regular art clay or PMC+ use cone 014. 011 is the hottest possible cone for the most durable item. (Actually if your rate is 585F in the last 200 degrees then cone 020 works out to 1201F if you want to get technical) but we need a no hold time temp to fire to. Don’t try to fire PMC original if you have no way to hold for 2 hours.